Ian Fleming the author of the James Bond novels once said,”James Bond is a highly romanticized version of a true spy. The real thing is … William Stephenson.” Walking down Memorial Boulevard this week I photographed this statue of William Stephenson and when I got home I did a little research. 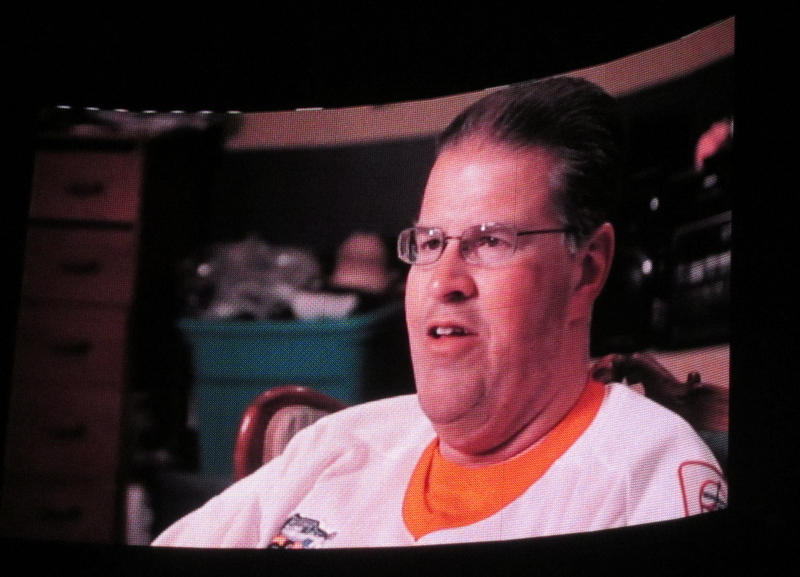 I was surprised to find that Stephenson was a Winnipeg native, born right here in the Point Douglas area where I live. He taught math and science at the University of Manitoba and before he died he bequeathed $100,000 to the University of Winnipeg to fund scholarships for outstanding students. 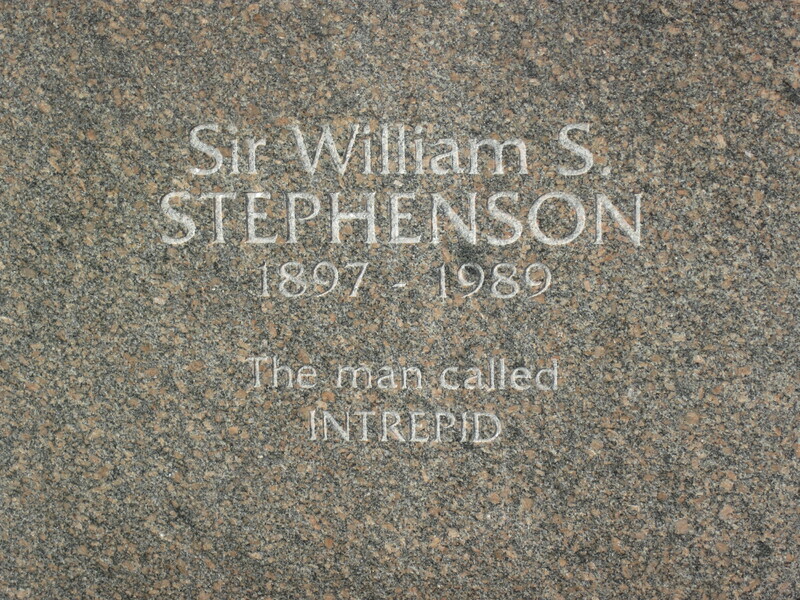 Winnipeg has an official fan club for Stephenson called The Intrepid Society. 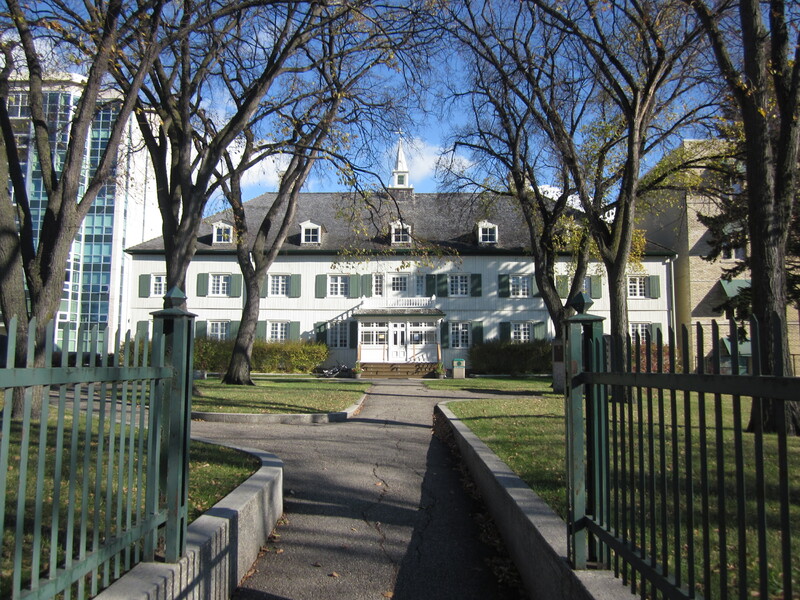 As part of their agenda they’ve successfully lobbied to have a street in Winnipeg named after their hero and a statue of him installed in CIA headquarters in Washington. DC. 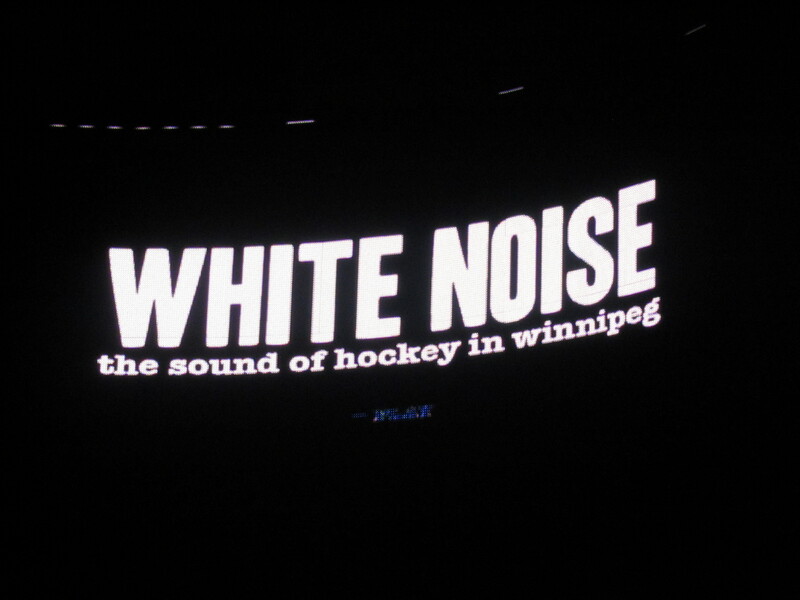 A public library in Winnipeg also bears his name. 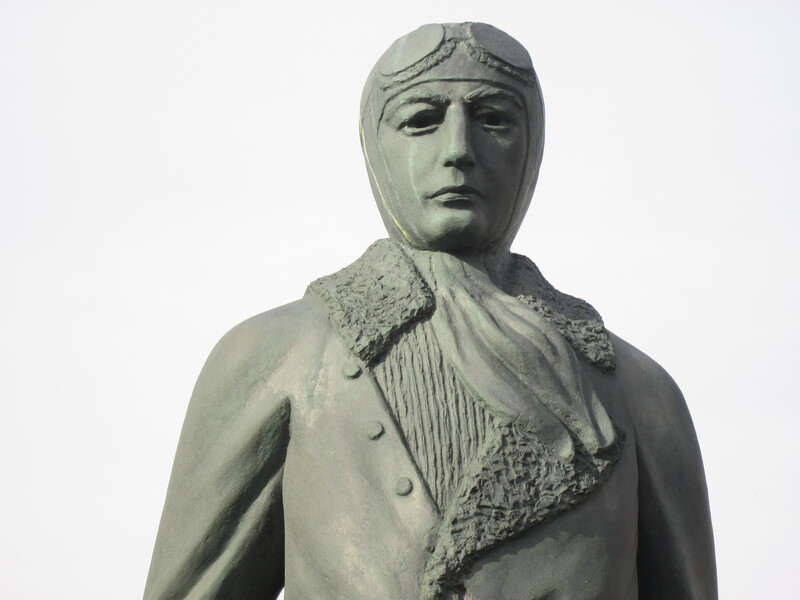 As this plaque on his sculpture indicates, William’s code name was Intrepid when he worked for British intelligence in New York during World War II. A book about his life titled A Man Called Intrepid was a best seller and later was turned into a TV mini-series starring David Niven and Barbara Hershey. Orphaned as a young child and then adopted, William was fascinated with Morse code as a teenager and was good at boxing. 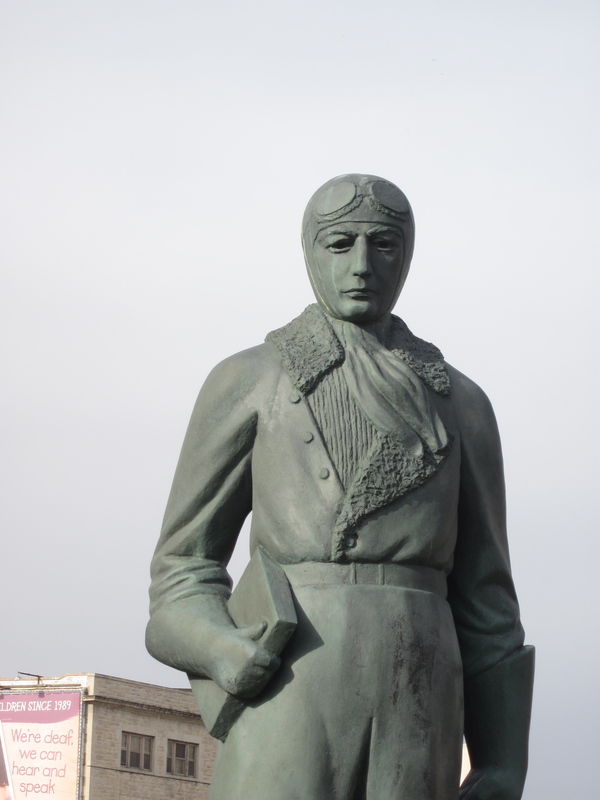 He served as a pilot during World War I and was shot down and captured by the Germans. He managed to escape after three months and won several medals for bravery. Stephenson went on to study at Oxford University. He obviously wasn’t looking for a job when Winston Churchill asked him to become the head of British security in New York coordinating counter-espionage efforts together with the Americans. He hired hundreds of people to work for him, many of them Canadians and he paid for their salaries out of his own pocket. He set up a school in Whitby Ontario that trained more than 2000 covert operators including Ian Fleming, the author of the James Bond books. 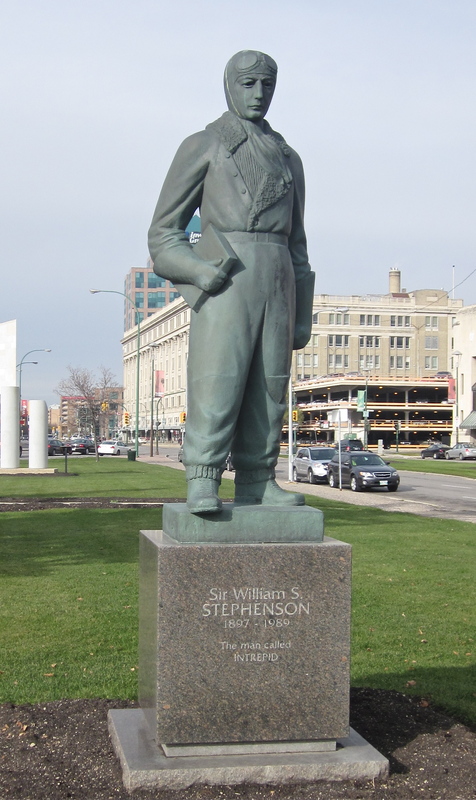 The sculpture of William Stephenson on Memorial Boulevard, was created by renowned Winnipeg sculptor Leo Mol and was unveiled by Princess Anne in 1999. I found a clip from the film version of The Man Called Intrepid on You Tube. I’d like to get a copy of the entire thing and watch it. 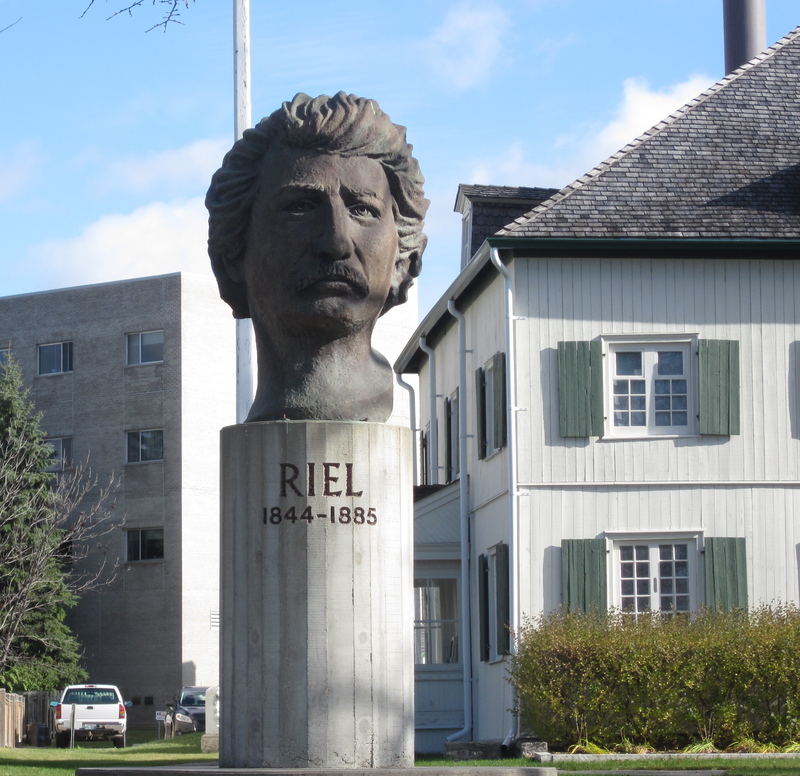 I had no idea the inspiration for Ian Fleming’s James Bond came from Winnipeg. 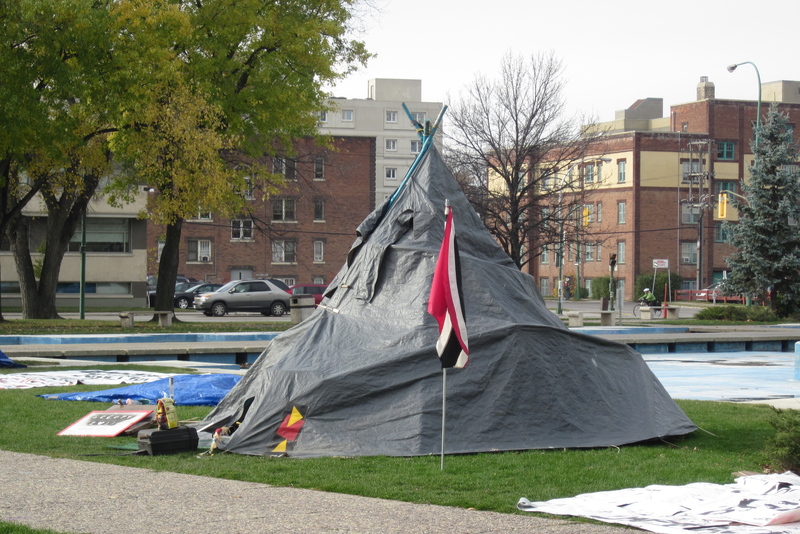 Yesterday on my walk I went down Memorial Boulevard and saw all these tents set up in the park. 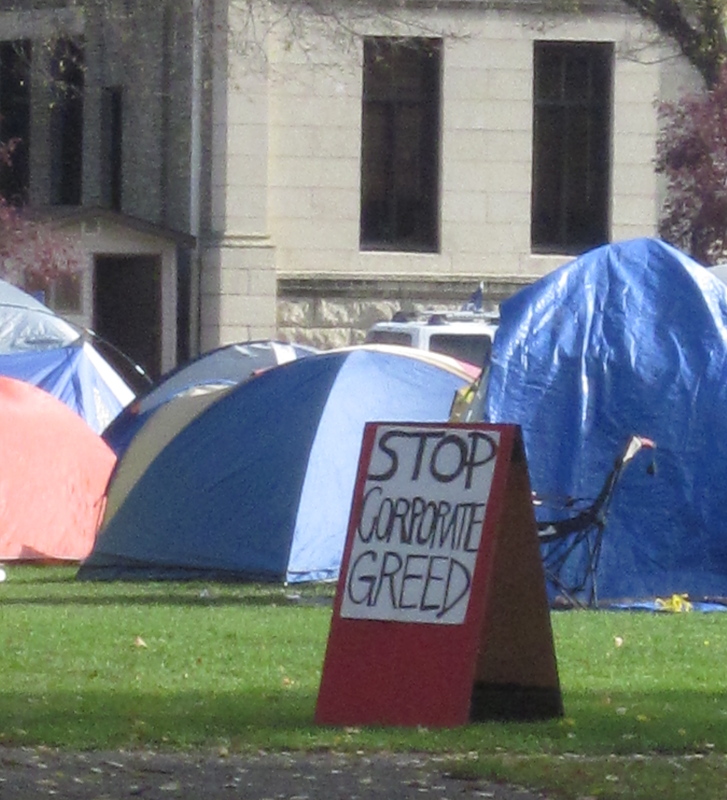 I started taking some pictures and realized when I zoomed in for this shot and saw the sign, that the encampment was part of the “Occupy” movement spreading across the world inspired by the Wall Street demonstrations that started on September 17th. According to an article in the Winnipeg Sun, Trevor Semotok, a spokesperson for the group says they are protesting the growing disparity between the rich and poor in Canada and promoting the idea that “people should come before profits.” The sign here says “Canada owes $800 billion to private banks.” Chad Lozinkski another spokesperson for the Winnipeg group gave a less specific motivation for the protest when he was interviewed by the Metro News. He says “our strength is that we have no specific message. We are providing a venue to speak up about any issue. ” This kind of all-encompassing agenda is true of the group who is staging a similar protest in Toronto. A Globe and Mail reporter spotted a variety of signs in the Toronto camp including pleas to protect the environment, provide better services for the disabled, a warning about exploiting aboriginal people and a call to end poverty in Canada. 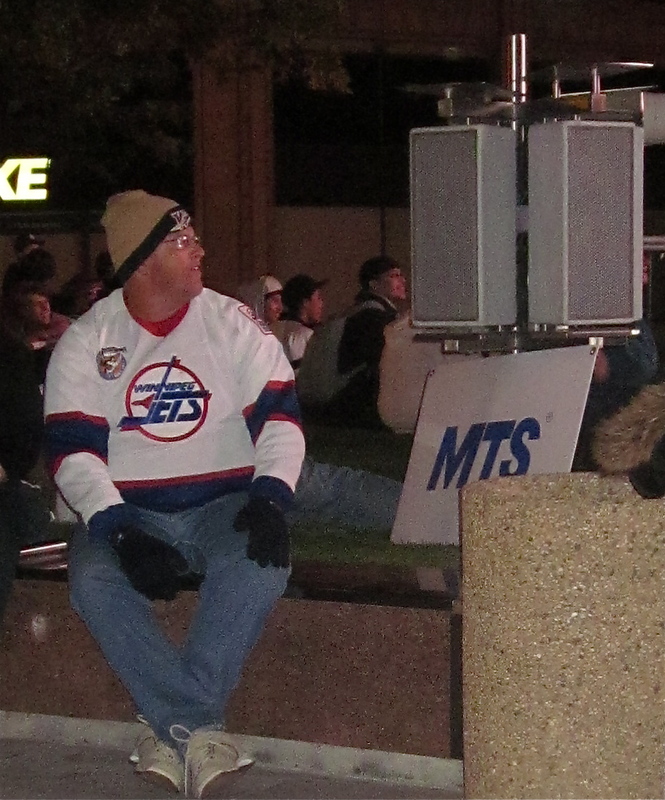 The Manitoba protest started on October 15th with 400 people participating in a march that originated at the Manitoba Legislature. According to Metro News there are only about 20 protesters left at the site. I think that is a bit of an under-estimation. I saw more than 20 people there yesterday. The National Post says that the mayors of most Canadian cities are hoping for a peaceful resolution of the protests. 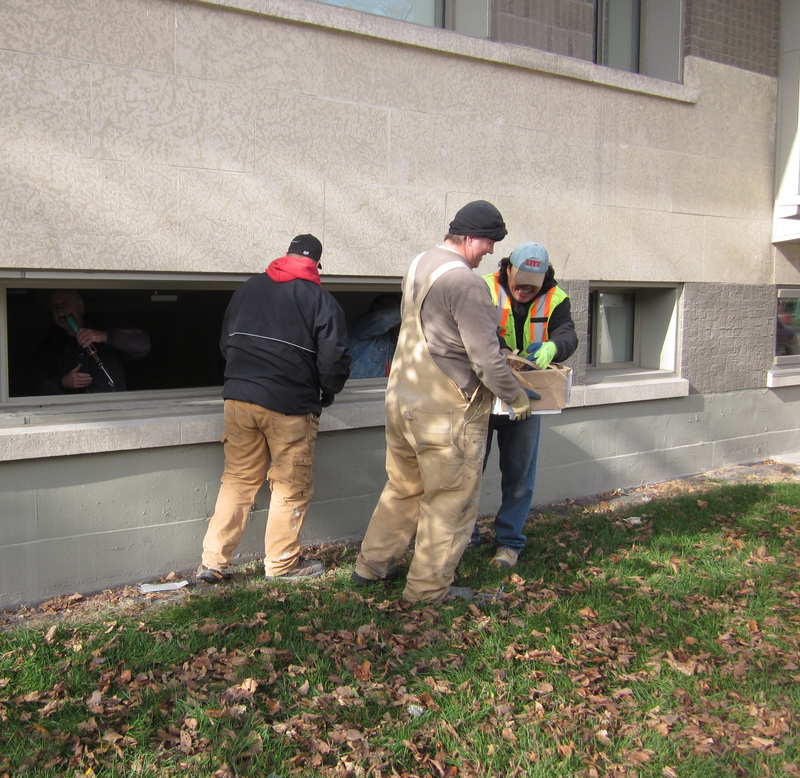 They think the cold Canadian winter will eventually drive the protesters inside, although the Winnipeg group has installed a fire pit and an insulated kitchen in hopes they can carry on the protest at least till Christmas. 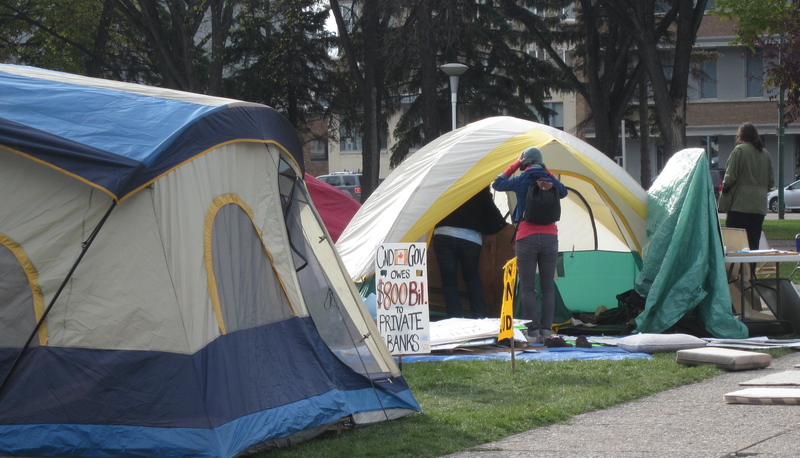 A 13-year-old girl at the site with her mother told the Winnipeg Sun she is protesting the fact that the wealthy who comprise 1% of the population, control 99% of the country’s wealth. The middle class is rapidly disappearing as the gap between the rich and poor widens. The teenager’s mother said it is a shame that there are people in our country still living in third world conditions. The gentlemen made their opinion of the protest perfectly clear. 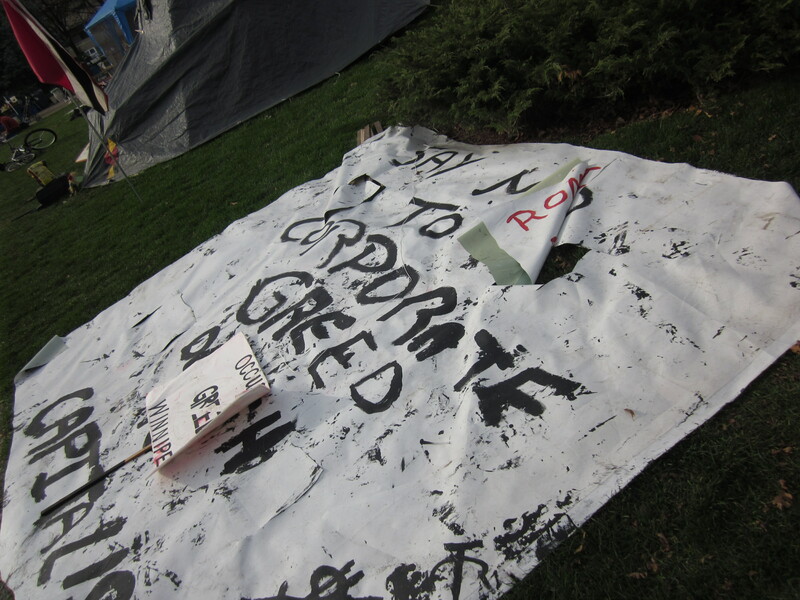 It got me thinking about my own opinions about the occupy movement. Certainly, as a child of the sixties, I know how effective protest can be in changing things. I was a teen in the era of Martin Luther King and the anti-Vietnam War protests. One thing that is different is that those protesters put a lot on the line to defend their issues. People like Gandhi and King went to prison for their anti-establishment ideas. According to the National Post, Vancouver mayor Gregor Robertson speaks for most civic leaders, when he says physical force and legal action will not be taken against Canadian protestors. I guess I also have to wonder if this kind of protest is as effective in changing things as taking some kind of concrete action to address the needs of the disenfranchised might be. 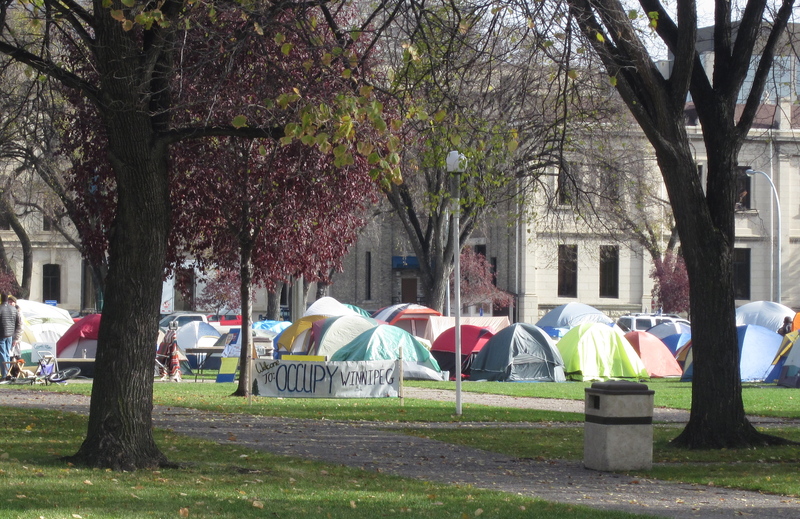 However one cannot dispute the fact that the Occupy movements are drawing attention and inciting lots of discussion. Last night, Diane Sawyer did a piece on ABC News about the growing gap between the rich and poor in the United States . She talked about the wealthy 1% of the population whose income has grown by 240% in the last few years. I went on the Cagle editorial cartoon site I often used with my journalism students and it is awash with opinion on the Occupy movement and the issues it presents. Like this cartoon by Steven Greenburg from California…..
And this one by Pat Bagely of the Salt Lake Tribune. I guess the protests are having the desired effect. People and the media are talking about the economic inequities in North America, and here I am writing a blog post about it. What next? 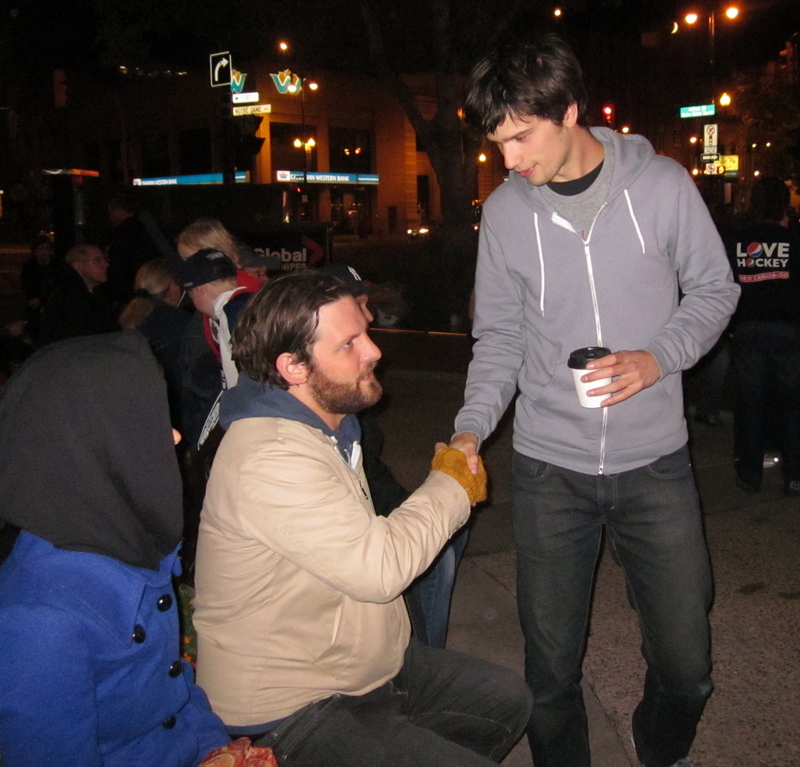 Maybe I need to go down to the Occupy Winnipeg site and engage the protesters in a conversation about what they are trying to accomplish. Maybe I need to think about what concrete things I can do to try to ease the disparity between the “haves” and “have-nots” in my community. On Friday my friend Esther invited me to visit the Mayberry Fine Art Gallery just one block over from my home to see an exhibit of paintings by Joanne Gullachsen. Esther thought we would enjoy the exhibit because Joanne, who is having her first public show as an artist at age 68, is a retired teacher just like we are, and she has been compared to Canadian artist Maud Lewis. Esther and I used to be teaching partners and we crafted a multi-subject learning unit on Maud’s life story and work for our students. Joanne’s paintings at the Mayberry Gallery are certainly ‘happy’ as Bill Redekop reports in his Free Press article about the exhibit. They are also reminiscent of Maud Lewis’ work and perhaps that of Grandma Moses, an American folk artist who like Joanne, only became well-known later in her life. Grandma Moses was ‘discovered’ when she was 78. Joanne grew up on a dairy farm in Manitoba’s Interlake region and her paintings which were all drawn from memory, and not from photographs, provide an intimate portrayal of her childhood. She painted the pieces over a period of 27 years while pursuing a busy teaching career and caring for her growing family. Each painting in the Gullachsen exhibit is accompanied by a short story the artist has written about what is going on in the scene portrayed. In this painting a neighborhood thief has taken off with the family’s milk pail and Joanne’s grandma is trying to flag him down as he whips his horse to speed away. What I loved about the Gullachsen collection were the personal connections and memories the paintings evoked for both Esther and me. As we ambled through the Mayberry Gallery with its bleached hardwood floors and high sunny windows, we shared stories from our childhood and family life, each story prompted by one of Joanne’s paintings. This painting reminded me of a photograph my mother took of my father looking after me as a baby, and managing to still read and study while he was doing so. 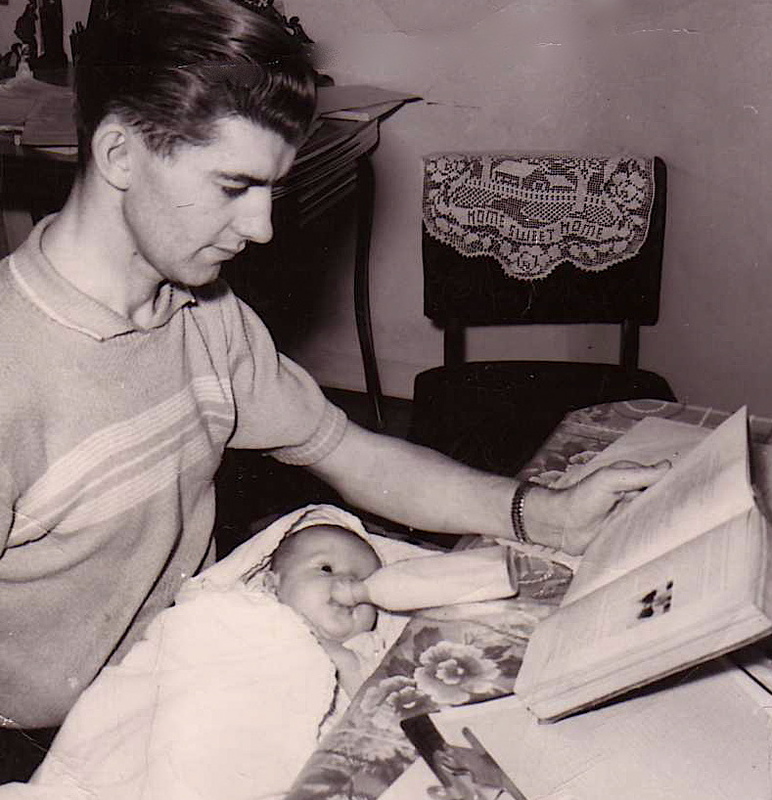 Dad had to multi-task because he was supporting and caring for a young family at the same time as he was in medical school at the University of Manitoba. This painting brought back memories of the dress my mother bought me from the Eaton’s catalogue to wear on my first day of school. 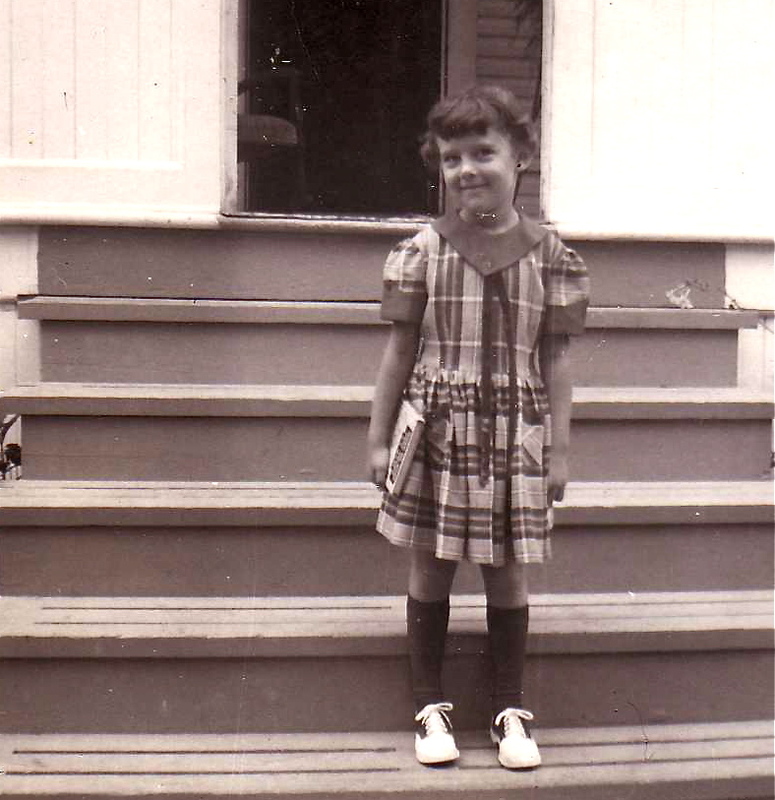 Mom always sewed all our dresses but because she wanted me to have something special for the first day of grade one, I got to order a dress from the catalogue. I still remember the excitement of the package arriving from Eatons. The dress was grey and red plaid. This painting reminded me of going out and helping my Grandpa Peters with the chores in the barn when I was staying at his farm in Gnadenthal Manitoba. It is winter in the painting above and it is winter in the photo below. 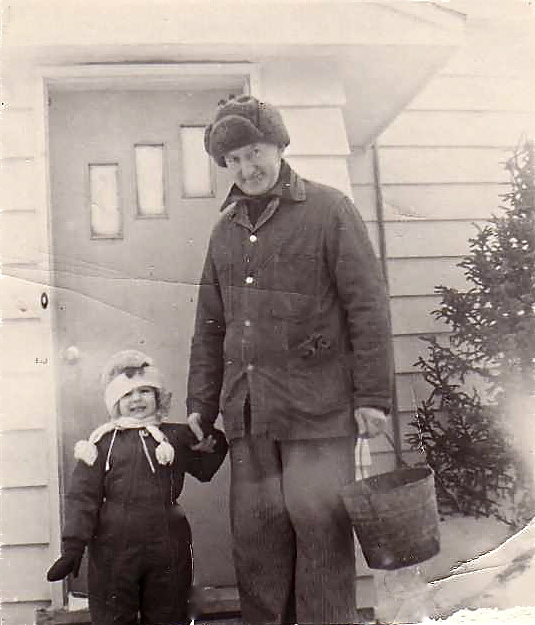 I am all bundled up to go out to the barn to milk the cows, pick eggs from the chickens and feed the pigs. Just before we left the gallery the affable owners, father and son Bill and Shaun Mayberry, stopped to chat with us. Esther mentioned that the reference to Maud Lewis in Bill Redekop’s newspaper article about Joanne Gullachsen, was what had brought us to the gallery since we were avid Maud Lewis fans. Bill told us they were in the process of putting together a collection of Lewis’ work to be part of an exhibition this fall. “I think four Maud Lewis paintings just came in today. Would you like to see them?” Bill offered. The Mayberrys unwrapped the Lewis paintings and laid them out on a table at the back of the gallery. Bill told us one of the pieces came from a woman whose mother had bought the painting for five dollars from Maud Lewis because she felt sorry for her. Bill pointed out some unique features in the paintings that aren’t found in Maud’s other works with similar themes. What a treat for us to see Maud’s paintings up close and to have our own little private viewing of some of her work, courtesy of the congenial Mayberrys. The last time I had seen any of Maud’s paintings in person was when I visited the Art Gallery of Nova Scotia nearly ten years ago. I will definitely visit the Mayberry Gallery to see the Maud Lewis exhibit when it opens. I am inspired by Joanne Gullachsen who is earning money and becoming recognized as an artist at 68. I read in her biography that she took art classes and was mentored by other Manitoba artists. Taking writing classes and finding a mentor or writing group to work with, is something I need to do as well, if I want to find a wider audience for my writing and turn it into a source of income. But I am only 58 so I still have a whole decade left to attempt to emulate what Joanne has done. Last week we had supper with John Lennon, Bob Dylan, Mick Jagger, David Bowie and Neil Young. We decided to try Johnny G’s Restaurant which is just across the street from our condo building. We can see the outdoor eating area on the balcony at the rear of the restaurant from our living room window. 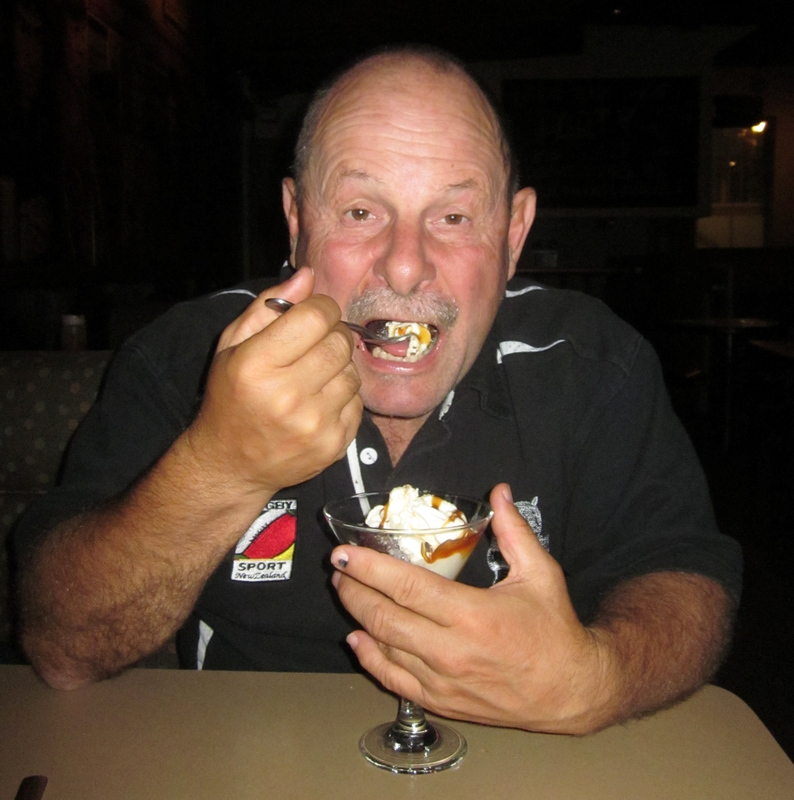 Someone told me the food was good and reasonably priced but I was a little apprehensive because on a number of different websites diners had given the food and service less than enthusiastic reviews. The restaurant’s main attraction seemed to be that it was open all night. My husband Dave who is a big fan of sixties and seventies music was happy to pose in front of the large mural just above our table that featured some pretty great musicians. I couldn’t fit Elvis Presley into the shot with Dave but maybe that was okay since his popularity pre-dates that of the other singers in the mural. The restaurant was a little dark but the waitress nice and friendly and we got good service since there was only one other person in the restaurant. We thought the food was fine. 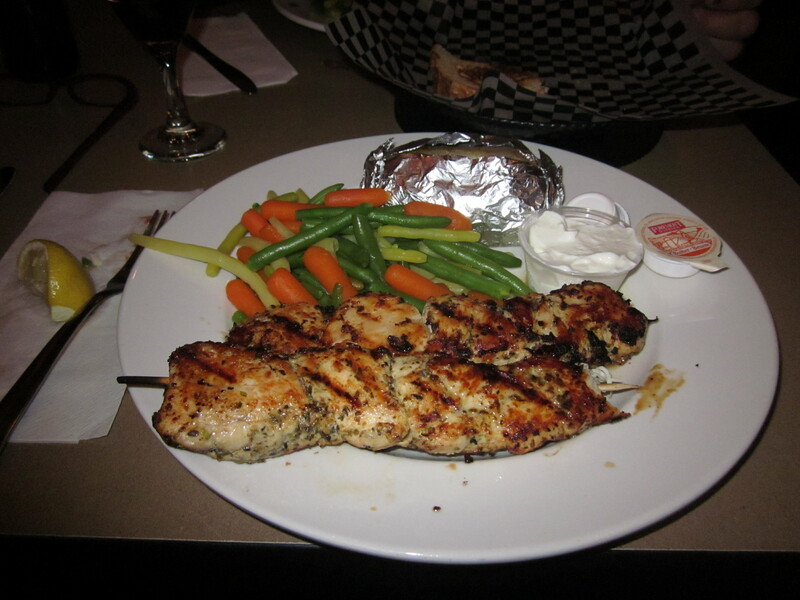 I had chicken souvlaki and Dave had ribs. I could only eat half my meat because the portion was so generous. There were lots of hot fresh vegetables and the baked potato was good. We had a Greek salad that was pretty pedestrian. Our meals were both part of a daily special that included a brownie with ice cream and caramel sauce. As you can see Dave enjoyed his. Our meals were just $14 each and included everything. We may not be gourmet experts but we figured we’d had a decent supper at a fair price. 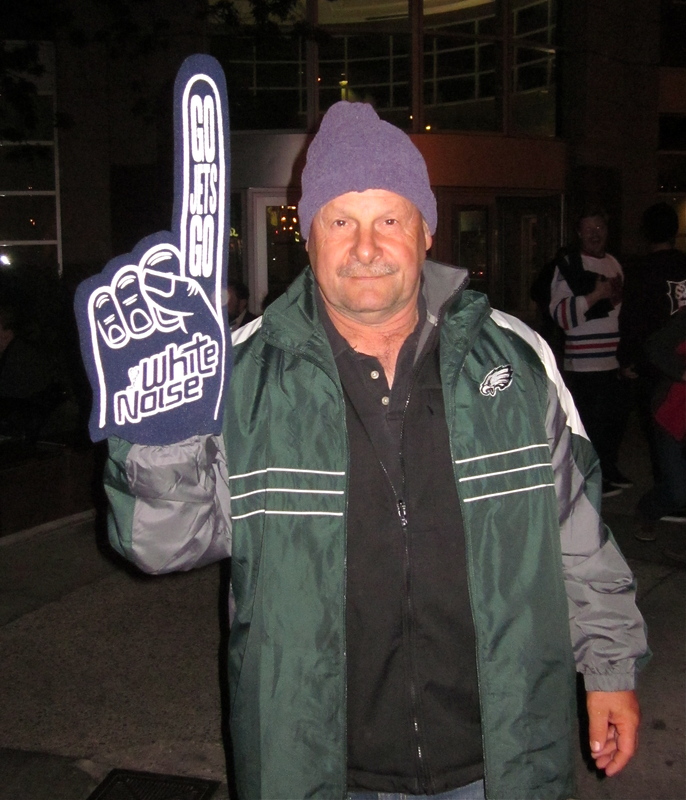 There are two Johnny G’s in Winnipeg, one on McDermot Street and the other on Main Street. What next? I did some research but couldn’t find out who Johnny G’s is named after, who painted the mural or anything about the history of the restaurant. I may need to make a return visit if I want to learn more about this neighborhood eatery. 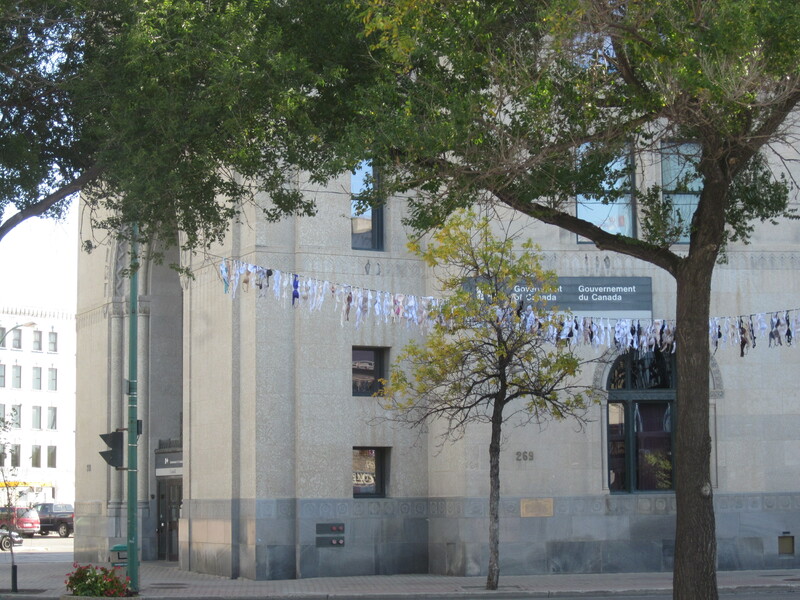 Yesterday morning when I went for a walk I saw what I thought from a distance were flags strung up in front of a government building on Main Street here in Winnipeg. When I got closer I realized they weren’t flags—they were bras and they weren’t just in front of one building they extended down the block on both sides of the street. On my return walk I noticed this window display in a Business, Technology and Health Care College called CDI. In front of the college was another very colorful line of bras strung up between the street lights. 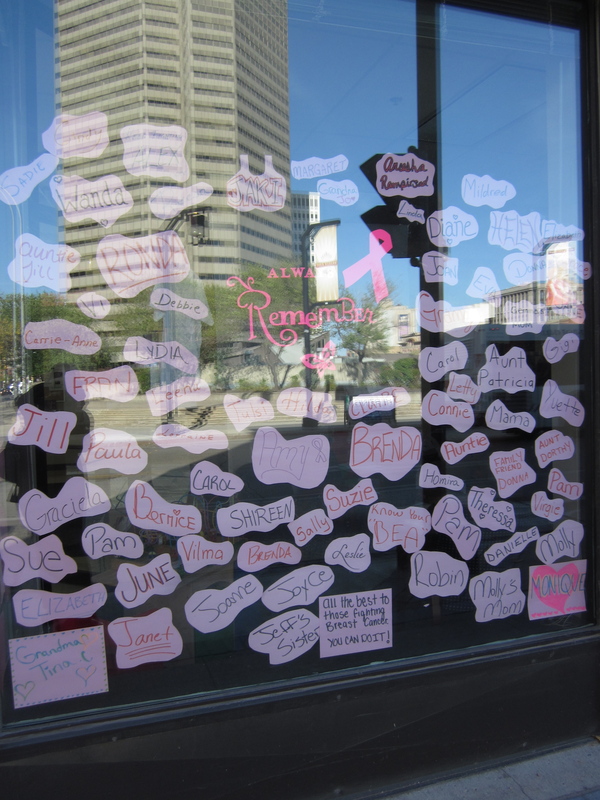 The window had the words ‘Remember Me’ in the centre and the signs said the names on the window were those of family members and friends of college students who were dealing with breast cancer. I realized then that the bra display must have something to do with October being Breast Cancer Awareness month. I checked it out on my computer when I got home and found out CDI College was participating in an event called Bras for a Cause which raises awareness of breast cancer and solicits funds for medical research. The college has been involved for several years, ever since a teacher on staff was diagnosed with breast cancer. I don’t know if there were 23, 200 bras flapping in the breeze on Main Street yesterday but that was the goal of CDI College. They wanted people to donate 23,200 bras for display because that’s how many women are diagnosed with breast cancer in Canada every year. In an article on the college website it notes that Manitoba Hydro volunteered the use of its machines and staff to put up the bras. The website had a link to the blog of a breast cancer survivor,a former CDI college student who was a special guest the day they strung up the bras along the street. Today is the CIBC Run for a Cure the annual Breast Cancer fundraising event sponsored by the Canadian Breast Cancer Foundation. The CDI College has entered a team that has raised nearly $10,000. I’m not sure how long the bras will be up on Main Street but they serve as a thought-provoking reminder that 100 Canadian women die of breast cancer every week and we can do things to change that statistic. Early detection and research for a cure are two of those things. The Bras for a Cause display certainly caught my attention. I hope it makes other people stop and think too.